First off...my apologies for a month of no new reviews. I found myself unemployed, job searching, re-employed, and in the role of single, full-time dad in rapid succession. This was a perfect storm in terms of time and focus. Many thanks to those of you that reached out to see if all was well. All is well...I hated the old job (dreaded going in--even though I adored my co-workers)....I really like the new job (they let me do my job)...and I am pretty fond of my youngster (Happy Meal), so things turned out nicely. I had tried the burger at Rascal in the past, and I found it to be of high quality but aggressively seasoned. I had high hopes for a gentler touch on the seasoning shaker on this outing. 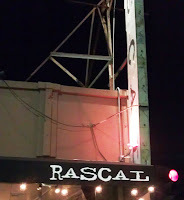 Rascal was a gastro pub, so the quality of the ingredients and preparation was not likely to be an issue. I spoke at some length with Chef Michael, and I learned that the ingredients were of even higher quality than I had anticipated. I ordered the Rascal Burger ($11), and I asked that all of the toppings be delivered on the side. My cheeseburger arrived in about 10 minutes. The Beef: Wow! This was a 21-day, dry-aged blend of Chuck, Rib Eye, and Sirloin from Harris Ranch. The 80:20 beef was delicious. The aging provided an appropriate level of funk to the bite. The Sirloin and Rib Eye provided complexity in terms of steak texture and a richness of mineral and beef notes. The bite was tender with the Sirloin providing exactly the right amount of resistance. 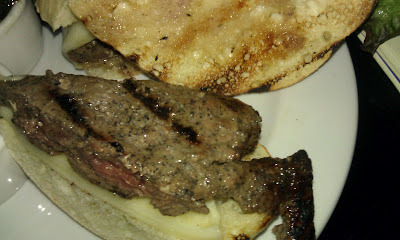 The Sirloin lingered to remind the diner that this was a patty of ground steak. The beef at Rascal was most satisfying. The Seasoning: The seasoning on my Rascal Burger was a hickory/mesquite-infused blend of salt and pepper. In a smaller dose (1/3), this would have been effective and delicious. However, the sheer amount of seasoning altered the taste of the dish to resemble meatloaf. It required some judicious wiping down to allow the beef to shine through that blast of seasoning. 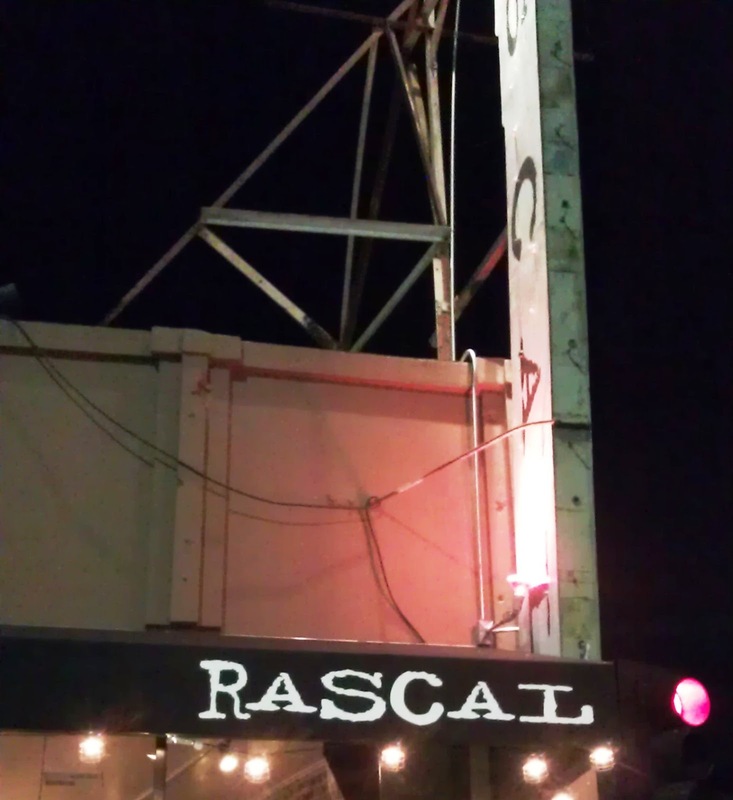 The Sear: Rascal cooked their burgers on a gas-fired grill with cast iron grates. The sear was limited to thin grill marks. The sear was decidedly lacking, but this was countered by the truly excellent quality of the beef. Still, a crisp sear would have been nice. The Preparation: The burgers were pattied up during the prep cycle and allowed to rest. 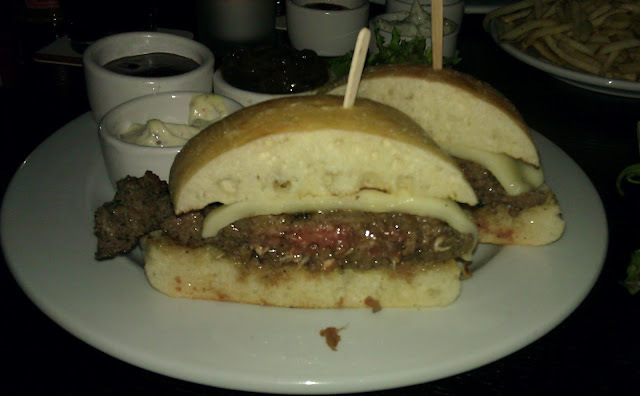 The patties were formed with medium pressure to create firmness without chewiness. The ground beef was not over-manipulated. The irregular, 1/3 pound burgers were turned once during the cooking process to bring the temperature up to Med Rare, as requested. The Cheese: Rascal employed a sliced of provolone to do the job better suited to a slice of Monterey Jack Cheddar. The mild Provolone was lost in the heavy seasoning and firm steak textures. The cheese was wasted in the dish and only served to provide calories. The Bun: The burger bun at Rascal was a torta provided by La Brea Bakery. The torta was nominally toasted, but it was fresh and just chewy enough. The torta was savory, and this would have been very nice had the cheeseburger not been over-seasoned. The Meat-To-Bun Ratio: This was just right. The Toppings: The caramelized onions were nicely sweet and the greens that accompanied the burger were fresh and crisp. 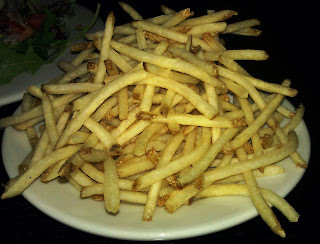 The Fries: The fries at Rascal were hand-cut and par-cooked. The peel-on, shoestring fries were perfectly seasoned, and they remained crisp as they cooled. The fries were solid. The Value: A Rascal Burger was 10 bucks. A plate of fries was $3.50. The burger was properly priced when one considered the ingredients. The fries were a poor value. Altogether, the value was average. Rascal served a burger worth checking out...I would suggest that the diner request light seasoning, since I have encountered an over-seasoned burger on both of my visits. The ingredients were terrific, and the burgers were formed and cooked with care and competence. Burger Review : A very good, but over-seasoned burger. This one had great potential. Glad to see you're back. I just assumed you took a break. Hope things are going better! Pete, it's great to see you back! Whilst I'm in the UK and will never get to eat the burgers you review, I love reading about them! I feel that most ground beef doesn't have enough taste on its own. I am a big proponent of seasoning the crap out of it. So I would probably love this over seasoned burger. Plus the news that the beef is a 21 day dry aged combo of chuck, rib eye, and sirloin, makes me want to drive to LA this second. I can't WAIT to try this. I like my buns toasted more than your review and your photos show they are. I wonder if a customer could tell a waiter that she wants her bun extra toasted, without them overreacting and toasting it too much. Oh well, this is something you'd hope the kitchen has the right feel for to begin with. So Pete, do you recommend ordering this burger without cheese? Is Provolone the only cheese Rascal's offers? Nice write up. I'm in awe that you've written hundreds of burger reviews yet still manage to come up with fresh ways of describing the taste of the beef. Yes, I think Provolone was the sole cheese choice. I would suggest that one order the burger without the cheese....perhaps 2/3 of the customary seasoning, and ask them to cook the burger on the hottest part of the grill to get a sear going. Best to you, and thanks as always. Have you ever asked a waiter "to cook the burger on the hottest part of the grill to get a sear going?" You are darn right that I have....If I like a burger, but it has a lacking sear, if I return to the restaurant, I will make the request every time. As the consumer, I have a right to ask for what I want. Notably, I always make the request at Wolfgang's Steakhouse. They are remarkable accommodating.